Did you know the symbol of holding hands on a Claddagh ring is the same as the Roman symbol for pledging? With time, Claddagh came to being after ‘fede’ rings and European as well as Irish improvisations. The history of Claddagh Wedding Rings makes it one of the most popular traditional designs to consider when buying a Claddagh wedding ring. When I was looking out for the best diamond engagement ring, Claddagh was a superior design because it meant much more than what it looked. I was smitten! That’s why I wrote this post so that you can fall in love with this rich and heirloom design of engagement rings popular around the world. What is the Claddagh Ring Meaning? 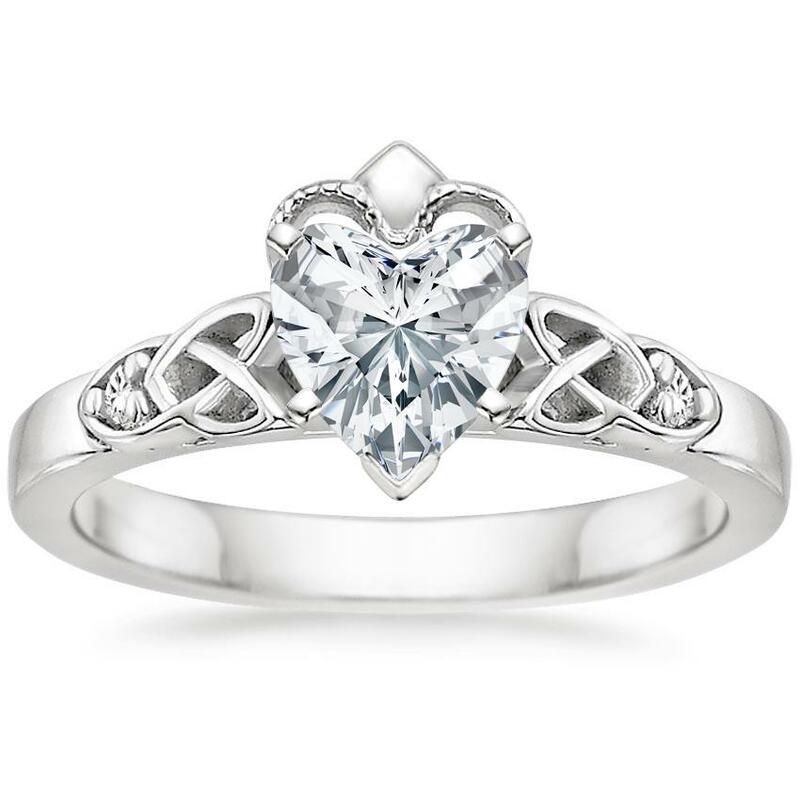 When you look at a Claddagh Ring, you see hands and heart of love. But, it was made to represent much more than that. It goes without saying you need to look deeper because you can see the friendship represented by hands, love represented by heart and crown representing loyalty. From Jim Morrison to Julia Roberts and Jennifer Anniston, there are many Claddagh ring fans you and I both know of. It’s a design that has stayed alive for hundreds of years. 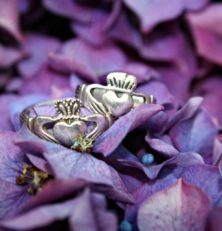 Did you know Claddagh ring is passed down from mother to daughter? Is there a History to Claddagh Rings? Of course, there is! Moreover, it is 400 years old too! Claddagh ring is inspired by gimmels or fede rings from the Roman times. While roman rings hand joined hands, Irish designer Richard Joyce (most probably!) worked on the heart and crowning separately. The ring is named after the place Claddagh in Galway where it was made first. Did you know Queen Victoria started wearing the Claddagh ring and passed it down to King Edward VII and George V after visiting Ireland in the 19th century? It’s a traditional ring with many meanings and promises backing it. Why buy Claddagh Ring to Propose to your love? One of the lores around the history of Claddagh rings says Joyce created the ring to propose to his sweetheart after returning from a long shipwreck. Another story says, Joyce was captured and he made the ring out of gold stolen from his owner and proposed to his ladylove when he says she waited for him. If you’re proposing, do it like Joyce with the words, “Mo grá thú”, translated as “You are my love”. The proof is that the earliest rings had Joyce’s initials! The story is a really romantic drama to imagine all-day long. Now you know why I was smitten by Claddagh. It’s lovely, innit? Claddagh rings are the universally blessed symbols of love. It can never go wrong! Moreover, it is believed getting a Claddagh wedding ring makes you lucky in marriage! Set in18K White Gold with other metals such as Platinum, 18K Yellow Gold, and 14k rose gold available, Celtic Claddagh Ring from Brilliant earth is priced at $990 for setting only. 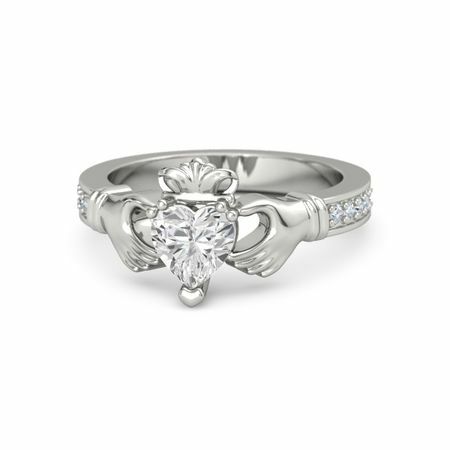 A beautiful cluster set diamond engagement ring with Claddagh design, this is a pure steal set in 10K white gold. It is set with three diamonds in a prong setting at $299!!! A piece of dramatic beauty from Claddagh, this Ashford ring is a pricey bauble at $5, 658 for 18K White Gold, manufactured to perfection. The center diamond is almost 0.7 carat while there 12 round diamonds embedded around. A breathtaking design from Zales, this mesmerizing diamond engagement ring is a steal at $1,099! It is set with 0.5-carat diamond in 10K white gold. What more can you ask for? 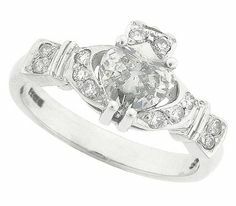 Set with a center stone of heart cut white sapphire, this is a Claddagh wedding ring to die for! The shimmering beauty is priced at $2,385 with 14K white gold. You can choose the accent stones and metal or center stone on your own! Pretty baubles of beauty and esoteric value, Claddagh rings instantly make a girl say yes! Wearing the Claddagh ring anyway is fine, but it is the best to wear it according to traditions. Did you know wearing the Claddagh engagement ring on the right-hand ring finger facing away from you means you’re looking for love? Now, you know what I mean! When on the left-hand ring finger pointing with the heart pointing towards you, Claddagh means you are engaged!